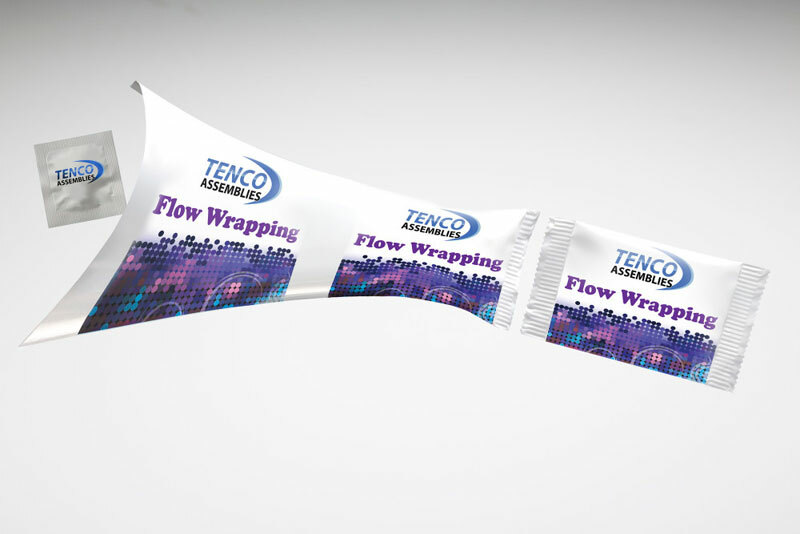 As an accomplished contract packager, at Tenco Assemblies, Inc., we offer many packaging options, including flow wrapping. Flow wrapping is a cost-effective packaging method for containing either a single article or a bundle of items in a clear or pre-printed polypropylene film. The process is also referred to as fin sealing because it produces a “fin” on the bottom of the package. Flow wrapping is used for packaging millions of different items, some common applications include wrapping individual candy bars, creating medical kits, pre-packaging eating utensils, making packs of baseball cards, and collating promotional literature and coupons with a sample item. Polypropylene film has excellent protective qualities, and we offer a variety of film options. You can choose a clear film that provides a full view of the package contents, or an opaque film printed with attractive graphics and product information. Our facility is equipped with high-speed flow wrapping machinery with integrated automatic feeders, enabling us to package at the rate of more than 200 pieces per minute. Another benefit of our flow wrappers is that they have the capability to print on-line and then register the printed film to ensure every single package looks identical and is wrapped correctly. With our flow wrapping capacity, we can fulfill large orders in a short amount of time. Flow wrapping can also be coordinated with our other packaging services, such as labeling, tipping, or POP display packaging. As an FDA registered facility, we are qualified to flow wrap consumer healthcare products, medications, and other items that fall under regulatory guidance. To learn more about our flow wrapping capabilities or request a quote, contact us today.